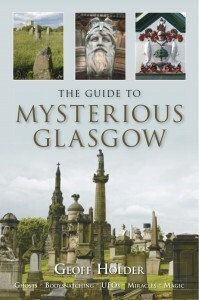 A guide to all that is strange, bizarre and occult about the industrial city of Glasgow. It is very much a practical book, with maps and descriptions of the things that can be seen. Holder’s remit is wide-ranging and he provides detailed reports about symbolic statues and the strange objects lurking in local museums. As well as the obvious mysteries like ghosts and UFOs, the writer discusses panics caused by body-snatchers. Bizarre and eccentric characters tumble off the pages. As you would expect in a modern city, there are few ancient mysteries to uncover, but Holder manages to find some. He is also not afraid to be sceptical, exposing urban legends and local hoaxes. If there is any criticism, it is that parts of the text are lists of things to see. However, it is a guide book, so finding things is its purpose. Many books of this nature are published every year. This is one of the best. The author lets his sense of humour blossom, among with his learning. With this volume as a companion, the reader is set to discover the nooks and crannies of Glasgow’s topography.